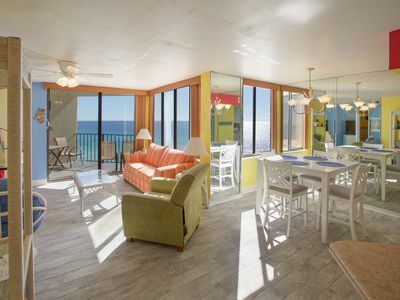 Open for Jan & Feb Spring Break Book these weeks before they are gone! No Elevators! 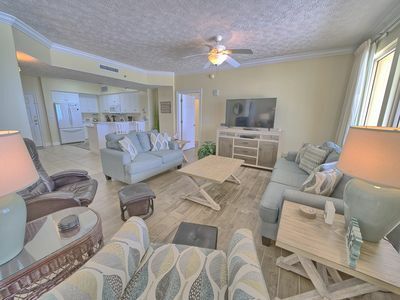 This Tidewater Beach Resort large ground floor 3 bedrooms 3 full baths condo is an end unit that sleeps 10. 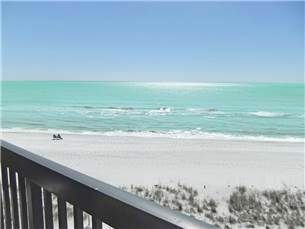 It is 1 of only 2 Tidewater condos with 12 ft ceilings giving it a very large and spacious feel. 2 King Beds, Set of Queen Size Bunk beds Commercial Grade Queen sofa sleeper. 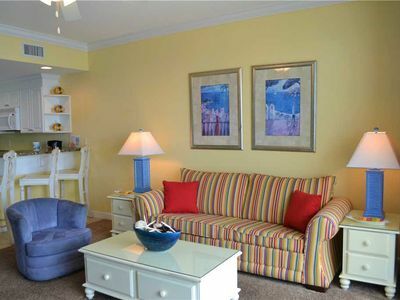 It is great for a large family or 2 families or Groups sharing the Spacious condo. One of only a few Ground floor condos at the complex. We rent Sat to Sat. during Spring Break, Mid May to Mid - October Seasons. 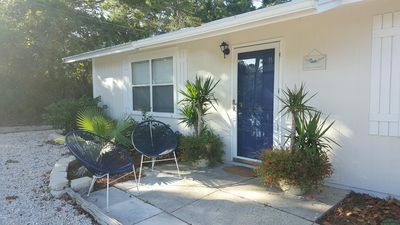 Some 3-5 night and Weekend rentals are available during late fall and late spring or for occasional last minute bookings. No cash security deposit required for families. 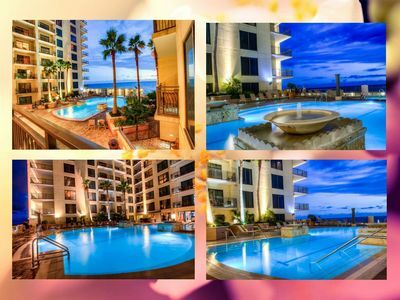 Tidewater is one of the newest resorts on Panama City Beach and is a great family resort with lots for kids and adults to do on property and nearby. Great Amenities! 3 pools 1 is indoor. 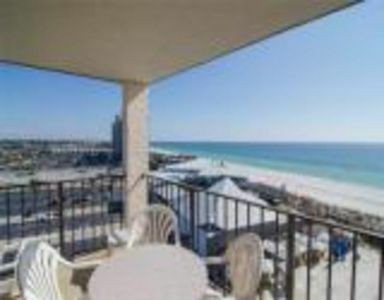 There is a Movie Theater on site, Tiki Bar by east pool, Bar and Restaurant on first floor best work out area anywhere on the beach, Free WI-FI in unit, grilling areas on site. 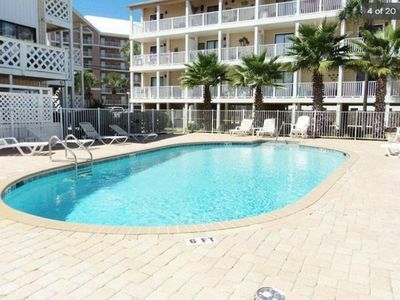 Located a short walk, 1/3 of a mile west, of Pier Park Mall and entertainment center. Master Suite King bed, flat screen cable TV and an ensuite bathroom. Separate walk in shower and a Tub and Shower combination. 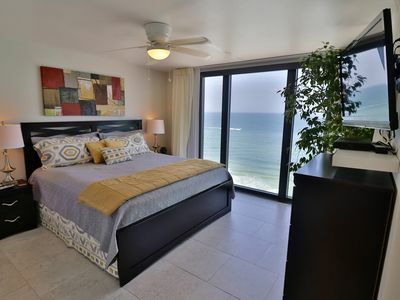 This bedroom has a spectacular view of the ocean and the sand dunes from large windows. 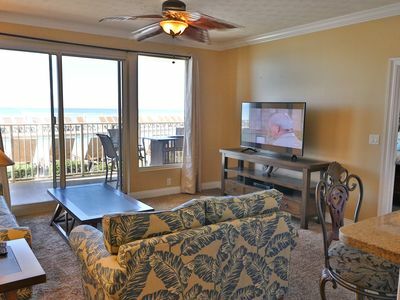 2nd Master BR King bed flat screen HDTV with cable and a private full bath. 3rd bedroom has Set of Queen Size Bunk Beds That's Right Queen Bunks! And has a flat screen TV with cable. 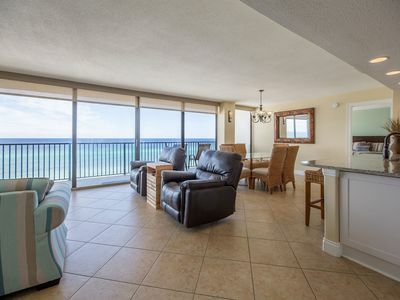 At least 1 guest must be age 25 to rent this condo. There is a one-time resort fee of $25 + Tax, for parking passes and resort wrist bands paid to the resort at registration. A $300 Reservation Down Payment is charged to the credit or debit card you provide to take this condo off of the rental market for you. If you cancel for any reason this down payment is nonrefundable. Final Payment for accommodations must be received 30 days prior to arrival. Exceptions made for last minute bookings. 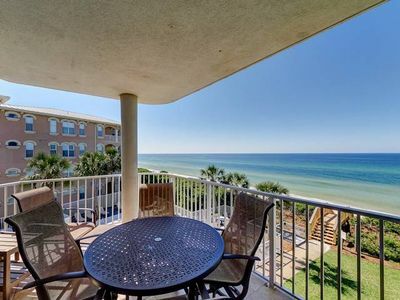 Beautiful Gulf Front Condo ~ Quiet Beach Community ~ Gorgeous Views of the Gulf! Last Minute Specials! Oceanfront!!! Special Rate!!! The Largest Floor Plan at Sunbird! Free Beach Chairs and WIFI too! 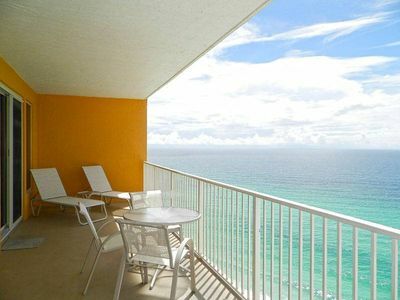 Pinnacle Port Vacation Rentals- C1 building, 2 bdr. 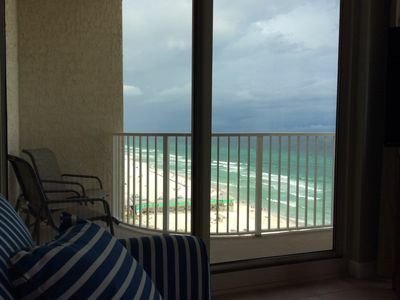 2 bath Gulf Front condo! 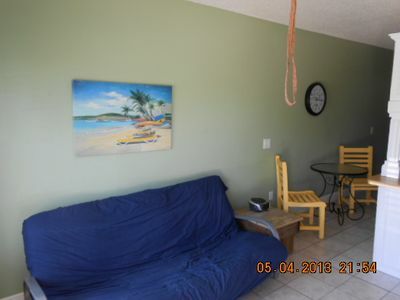 Just Steps To The Beach - Pets Allowed! 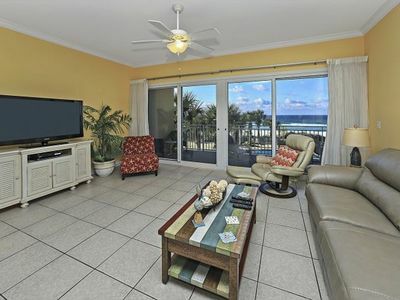 BEAUTIFULLY DECORATED Watercrest 3 Bedroom 3 Bath w/ free beach chairs!! 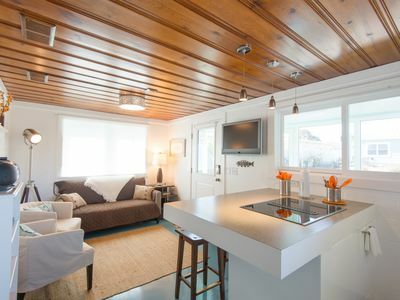 Hideaway Cottage, Laguna Beach. 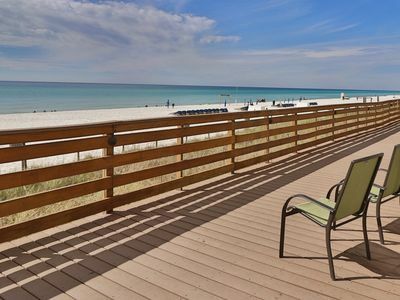 Taking spring break, summer reservations now! 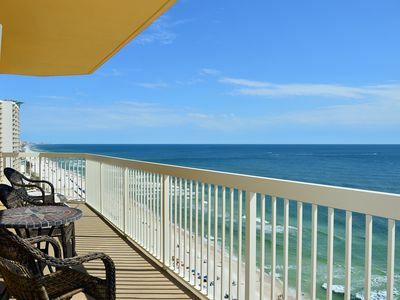 Gulf-Front 2-Bed Condo for the Perfect Vacation! 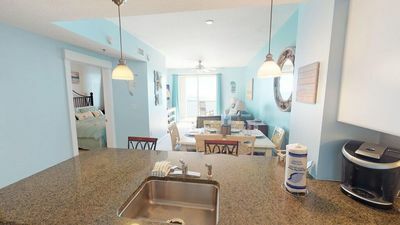 Sterling Beach 3BR 2BA 2nd floor beautiful condo!!! Origin 1325! 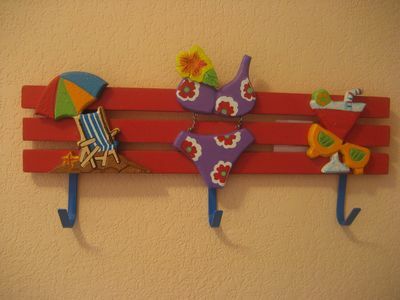 Create Your Best Beach Memories In This Perfect Studio BY ZIA!